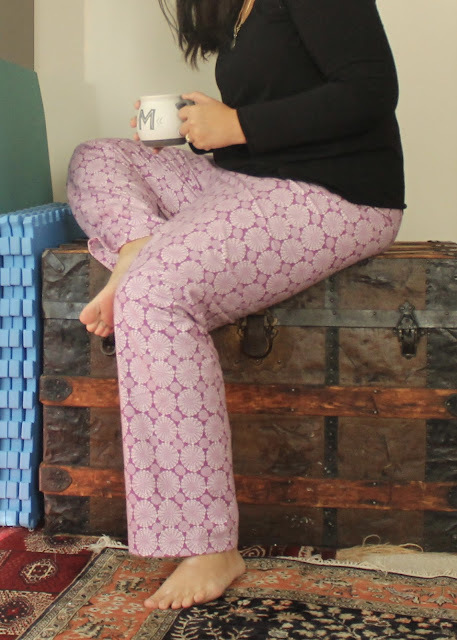 A few news pairs of pj pants are on my informal 2018 to-sew list. I ordered some printed flannel during Fabric Mart's pre-cut sale last month to make a pair. This is 44"-wide quilting flannel, which works fine for pj pants, though I expect it to pill quite a bit. It's very nice and thick. 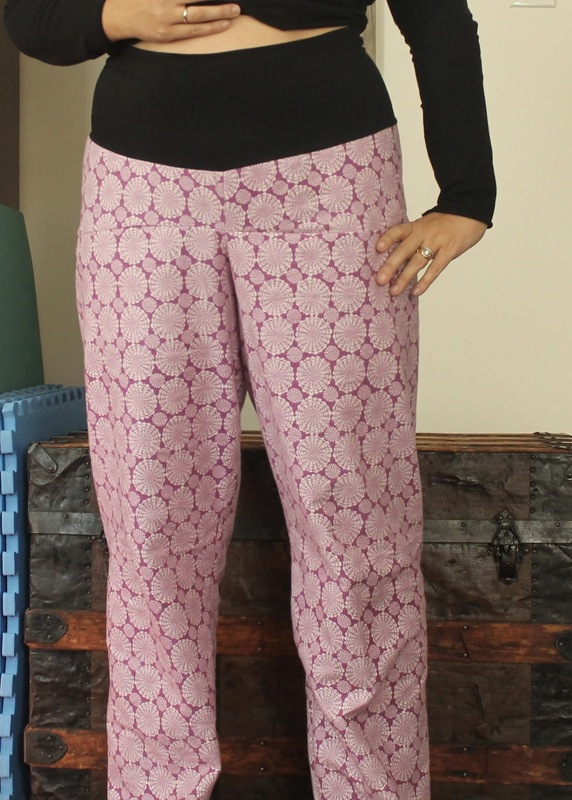 The pattern is Simplicity 1563, which I picked up during a Joann's pattern sale sometime last year. The pattern includes a robe as well as several knit nightgown and pj shirt options, and the pants and robe are sized for both men and women. I was surprised when I opened the envelope - this is an adult pants pattern with only one pattern piece (well, two, if you count the drawstring, but I don't). And I was skeptical. Although my 45" hip put me squarely in the large size, I sewed the medium after consulting the finished measurements (46" hip). I compared the crotch curve to that of my Calyer Pants, which fit me quite well, to the curves on the Simplicity pattern. Based on that, I determined that I needed to scoop out the back rise about 1/2" and raise it an inch. I also took an inch out of the front rise. Because there is a single pattern piece, I couldn't take a wedge out (or add a wedge in) and taper to nothing at the side as I would normally do when adjusting the front and back rise. Instead, I drew a straight line across my pattern piece above the rise notches, and marked the center of the line. I then cut along my line starting on one side, ending just before the center. Then I cut in from the other side, ending on the other side of the center. This gave me a "hinge" in the middle of my pattern piece, and I was able to subtract front rise and add back rise with the same pivoting motion. Here's a picture. Unfortunately, none of this work ended up benefiting me, because I accidentally cut both of my pieces with the right side of the fabric facing up. Doh. 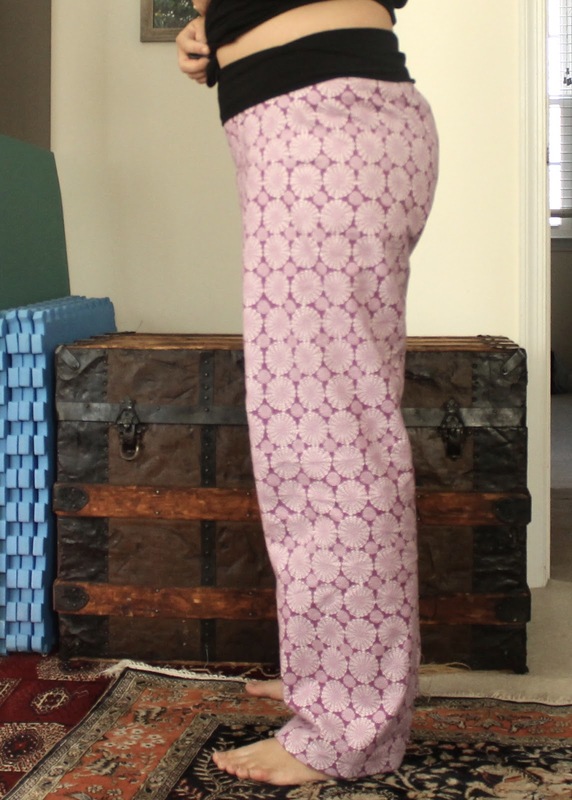 I didn't have enough fabric to recut, so I stacked my pieces and smoothed out the waistband and the crotch curves so that they were now symmetrical. Now that my front and back rises were the same height, I needed to reduce the front rise somehow. I made it work by taking a horizontal fish-eye dart out of my front rise. 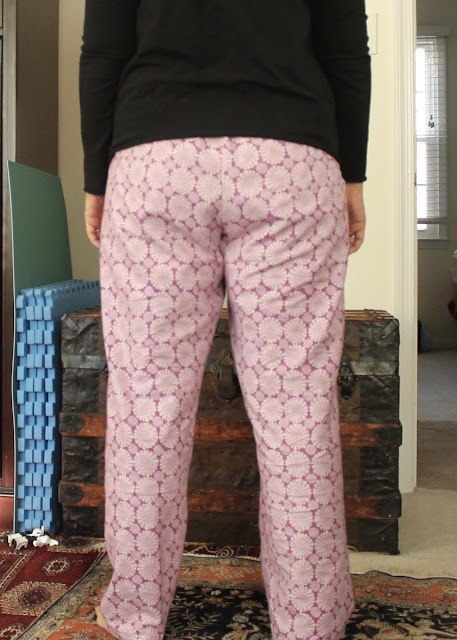 I had planned to make the elasticated waistband per the pattern, but, having lost my full back rise increase when I trimmed my pattern pieces together, I knew the back would be too low. I decided to cut a cotton/lycra knit yoga band instead. I cut it 30"x10.5" for a finished height of 5". I fold it down when I wear these. If I make these again, I'll definitely do the yoga band. It's just so comfortable. After I sewed the pants, I slimmed down the leg, taking in about 1.5" at the hem and tapering to nothing at mid thigh. This gave me a straight leg at the bottom, rather than a tapered leg, which was good because I ended up having to shorten the pants 2" after I sewed them together. I'm 5'8", but they do run quite long because they're meant for both men and women. As you can see above, I don't really have those yucky back leg wrinkles that often plague me in pants. But I am jutting my behind out a little bit to make that happen. When I relax, the wrinkles come back. I think that probably means that the bottom of the back rise, the part that curves to run horizontally, is a little too long. I'm very happy with the finished pants. I do find myself trying to put my hands in non-existent pockets. It didn't even occur to me to make pockets and without a side-seam, I would have had to make patch pockets. Maybe next time. Those are cute pants. I have been tempted to make some to wear around the house in the winter. I like the yoga waist. I have a skirt made that way, and it's very comfy. You should try the Lisette pattern, it's really nice with the extra details. A bit more work to make, definitely, but with much better opportunities for fitting, a back yoke, and POCKETS. Ditto, really nice pants but very long legs. Genius to use a yoga waistband. No worrying about elastic possibly twisting and becoming uncomfortable. Glad you made these work! These are lovely! They look so comfortable. I love the fabric too! 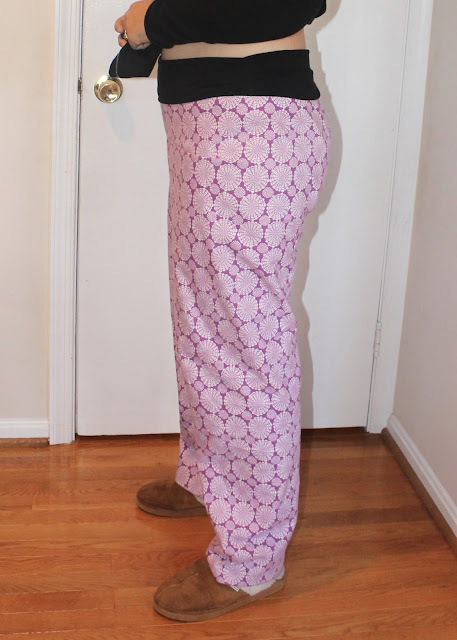 Yoga waistbands are the best on jammies pants! What a great idea!